Random Anny .Com: Free storage containers? Must be January! 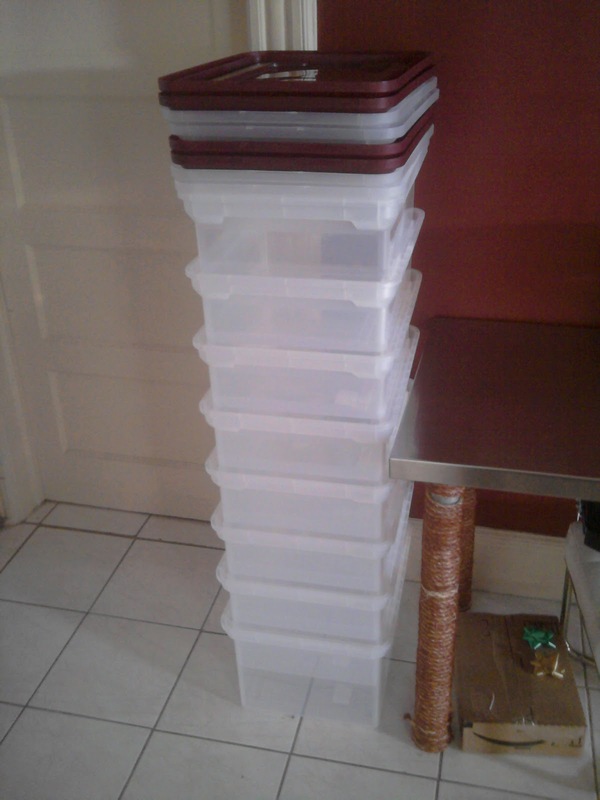 Free storage containers? Must be January! Into the basement with you! Its time for Staples and Office Depot to give away storage containers again! At both of these stores the items are free after rewards - meaning if you spend $10 you will receive a $10 voucher towards that store. Staples items are limit 2 per customer for the week and rewards are issued in the middle of the following month. They must be purchased in-store. Staples rewards can be used in two transactions and any left over balance after that is forfeit. Office Depot items are limit two per customer PER DAY and can be ordered on-line. Rewards can be used as many times as it takes for them to be used up - either on-line or in-store. The tricky (but awesome) part of this is the limit two counts per sku. Lets say you bought two of the green containers and two of the purple and two of the black and two clear and two clear with ruby lid, etc etc. You would get rewards back on all of these. Staples doesn't care if you pick one glow in the dark and one glittered tote - two is two. Done! Any coupons used on your orders will reduce the amount of money you get back. Lets say you bought the $18 batteries and used a $1 coupon. You paid $17 and will get $17 back. Yesterday I bought 4 of the $12.99 totes and used a $10 off $50 coupon. Today I can see my pending reward for $41.96 in my Worklife rewards history. Swank.